The Black Stars will arrive in Kumasi on Monday afternoon for Sunday's 2019 African Cup of Nations qualifier against Ethiopia. Coach Kwesi Appiah and his players have been holding a non-residential training camp in Accra in preparation for the match. The team will move camp to Kumasi for the opening qualifying match as they will arrive in the Garden City by 12:30pm. The Black Stars will hit the ground running with their first training session today at 3:30pm at the Baba Yara Sports Stadium. The team will hold its daily training sessions at 3:30pm at the Baba Yara Sports Stadium from Monday until Saturday. 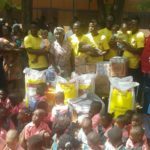 The Black Stars have also planned to visit an orphanage in Kumasi to make some donations and also give hope to the kids.